The creation of artificial embryos has moved a step forward after an international team of researchers used mouse stem cells to produce artificial embryo-like structures capable of 'gastrulation,' a key step in the life of any embryo. The team, led by Professor Magdalena Zernicka-Goetz at the University of Cambridge, previously created a much simpler structure resembling a mouse embryo in culture, using two types of stem cells -- the body's 'master cells' -- and a 3D scaffold on which they can grow. Now, in a study published recently, Professor Zernicka-Goetz and colleagues have developed the embryo-like structures further, using not just two but three types of stem cells which let them reconstruct a process known as gastrulation, an essential step in which the embryonic cells being self-organizing into the correct structure for an embryo to form. Once a mammalian egg has been fertilized by a sperm, it divides multiple times to generate a small, free-floating ball comprising three types of stem cells. At the stage of development known as the 'blastocyst' stage, the particular stem cells that will eventually make the future body -- the embryonic stem cells (ESCs) -- cluster together inside the embryo towards one end. The other two types of stem cell in the blastocyst are the extra-embryonic trophoblast stem cells (TSCs), which will form the placenta, and primitive endoderm stem cells (PESCs) that will form the yolk sac, ensuring that the fetus's organs develop properly and providing essential nutrients. In March 2017, Professor Zernicka-Goetz and colleagues published a study that described how, using a combination of genetically-modified mouse ESCs and TSCs, together with a 3D 'jelly' scaffold known as an extracellular matrix, they were able to grow a structure capable of assembling itself and whose development and architecture very closely resembled the natural embryo. There was a remarkable degree of communication between the two types of stem cell: in a sense, the cells were telling each other where in the embryo to place themselves. However, a key step in the life of the embryo -- gastrulation, described by the eminent biologist Lewis Wolpert as "truly the most important time in your life" -- was missing. Gastrulation is the point at which the embryo transforms from being a single layer to three layers: an inner layer (endoderm), middle layer (mesoderm) and outer layer (endoderm), determining which tissues or organs the cells will then develop into. "Proper gastrulation in normal development is only possible if you have all three types of stem cell. In order to reconstruct this complex dance, we had to add the missing third stem cell," says Professor Zernicka-Goetz. "By replacing the jelly that we used in earlier experiments with this third type of stem cell, we were able to generate structures whose development was astonishingly successful." By adding the PESCs, the team was able to see their 'embryo' undergo gastrulation, organizing itself into the three body layers that all animals have. The timing, architecture and patterns of gene activity reflected that of natural embryo development. "Our artificial embryos underwent the most important event in life in the culture dish," adds Professor Zernicka-Goetz. "They are now extremely close to real embryos. To develop further, they would have to implant into the body of the mother or an artificial placenta." The researchers say they should now be in a position to better understand how the three stem cell types interact to enable the embryo to develop, by experimentally altering biological pathways in one cell type and seeing how this affects the behavior of one, or both, of the other cell types. "We can also now try to apply this to the equivalent human stem cell types and to study the very earliest events in human embryo development without actually having to use natural human embryos," says Professor Zernicka-Goetz. By applying these studies side-by-side, it should be possible to learn a great deal about the fundamental aspects of the first stages of mammalian development. In fact, such comparisons should enable scientists to study events that happen beyond day 14 in human pregnancies, but without using 14-day-old human embryos; UK law permits embryos to be studied in the laboratory only up to this period. "The early stages of embryo development are when a large proportion of pregnancies are lost and yet it is a stage that we know very little about," says Professor Zernicka-Goetz. "Now we have a way of simulating embryonic development in the culture dish, so it should be possible to understand exactly what is going on during this remarkable period in an embryo's life, and why sometimes this process fails." 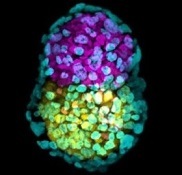 Illustration: Synthetic embryo-like structure made of three stem cells types in yellow, pink and green. Credit: Zernicka-Goetz lab, University of Cambridge.